Well Rio 2016 has finally come to an end. It was an Olympic games filled with records broken, controversy, GB success and green swimming pools. But it’s all wrapped up and medals have been won and counted. Whatever the global reaction to the Games as a whole, us Brits probably have a more positive outlook than most, as our athletes achieved an outstanding medal haul – our best ever! Enough of GB’s success though, as we don’t need to waffle on about how well they performed, that speaks for itself. What we want to analyse here is who the other over achievers were. What we have created is an alternative medal table for medals won per million people of the population. And I can guarantee you, it really puts the success of some countries into perspective. Lets take a look at what our medal table told us. As we can see its Grenada who will be giving themselves a pat on the back here, almost 10 medals per million people! The funny thing is they only won one Silver medal in the Men’s 400m, and only have 108,000 people living there! The Jamaicans were another nation that covered themselves in glory, just over 4 medals per million people, impressive! You could say it helps when you have the fastest man on the planet on your side though!. Big Usain collected another 3 gold medals on top of his other 6, and is said to be getting so bored of winning them that he may sell a couple on Ebay. Make of that what you will…. All jokes aside, every single one of Jamaica’s medals came on the track, maybe time for some field practice? In terms of the overall medals won, China was the other big hitters to make the top 3. But with 70 medals to show for the 1.3 billion people living there, it only accounts to a measly 0.05 medals per million people. Come on China, you should have run away with it. When it comes to under achievers you can’t look past our friends over in India. With a population of over 1.25 billion people and just two medals to show for their efforts, they finished as the worst medal winning country with an embarrassing 0.00 medals being won per million residents. Maybe if you look further into this, it shows funding for athletics really does play a part, instead of the amount of people to choose from. Grenada topped our Medals table! 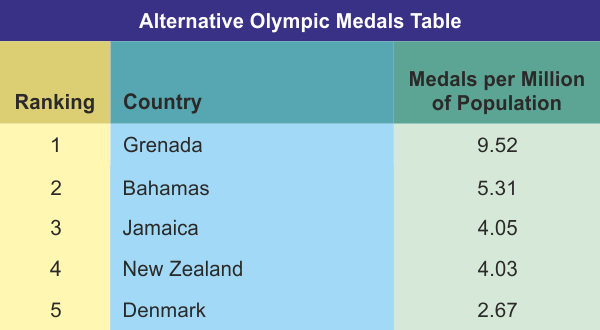 Well there you have it, our alternative medal table with some fun facts to go with it. We hope this brightens up your start to the week following the fun that came with the bank holiday weekend! Head to challengetrophies.co.uk or for any trophy or medal needs, who knows, you may fancy throwing your own back garden Olympics?